Konyin Adewumi at the IPVC 2018 presenting her poster on male involvement in cervical cancer prevention. Last month, I was given the opportunity to present my research work at the International Papillomarvirus Conference in Sydney, Australia. 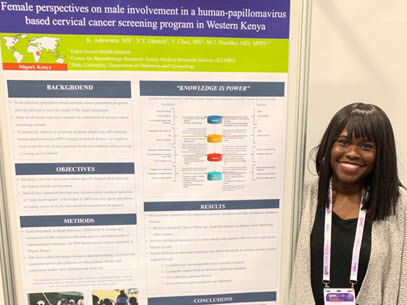 I submitted an abstract entitled, “Female perspectives on male involvement in a human-papillomavirus-based cervical cancer screening program in western Kenya,” a qualitative analysis that was part of an ongoing study at Duke’s Center for Global Reproductive Health. After taking the time to reflect on my experiences navigating such a great opportunity, I found that I had learned a few lessons that may be beneficial to others who are in my shoes—anyone who is early in their research career, unsure where the path is headed, but eager to make the most of the opportunities presented to you. One. Similar to your fieldwork, what can go wrong will go wrong. Plan accordingly—and when all else fails, learn to pivot. From arriving to the airport to find out that I couldn’t board the plane until the next day because of my visa to receiving a last-minute email telling me that my poster was not available for pick up, my departure was all a giant lesson in flexibility. Two. Know why you are there and what you want to gain from your time there. Then lean in and ask all the questions you possibly can. Think about it as Disneyland, except Mickey Mouse is THE expert in your field. As someone who finds herself intimidated around “experts,” I quickly became aware that by being too timid to ask a question, I was doing myself a great disservice and missing out on a chance to learn more. Three. Take a moment to celebrate yourself. You may not be the big shot doctor that everyone lines up to talk to after a presentation (yet), but you’re here because however small your contribution—you contributed to the body of work! And that is something worth celebrating. So, make sure that you do. Four. Take some time to decompress when you get home. However great an opportunity it was, you just spent hours traveling and days ingesting dense information (most of which probably went over your head). And you’ve probably shaken more hands and made more small talk than you could have imagined. It’s okay to spend the next couple of days winding down and relaxing. A young-Nigerian-American-womanist-scientist that had lived her whole life “under the umbrella of a patriarchal African society,” I enrolled in DGHI’s Master of Science in Global Health program in hopes of understanding my role in the global sexual and reproductive health world. Throughout my time at DGHI and in my work since, I have strived to gain a true intersectional understanding of women’s empowerment. By attending the IPVC conference, I was able to experience a diverse cohort of speakers and interact with a variety of researchers working towards the elimination of cervical cancer. The diversity of individuals at the conference served to (1) challenge historic imagery, engrained in my head, of global health as a series of neo-imperialistic ventures and (2) remind me that despite our current political atmosphere, diverse voices and powerful female leadership allow me to continue to hope for a day when the power to make decisions regarding the health of female bodies is no longer monopolized by white male politicians.